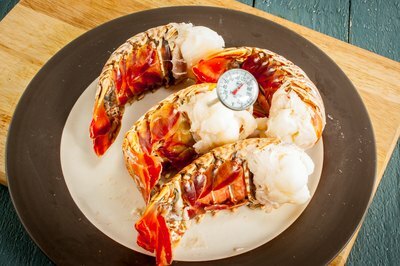 Lobster tail can be defrosted and cooked entirely in the microwave, producing juicy, tender, sweet, just-cooked meat. However, because microwaves cook unevenly, you need to pay careful attention during cooking and defrosting, to ensure that the tails do not become overcooked and rubbery in some parts. 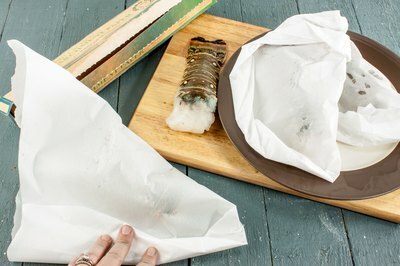 In addition to adding water and rotating your tails, consider cooking them in a steamer or wrapped in parchment paper to produce sweet, moist lobster meat. Smaller tails are best suited to microwaving, as they cook more quickly. 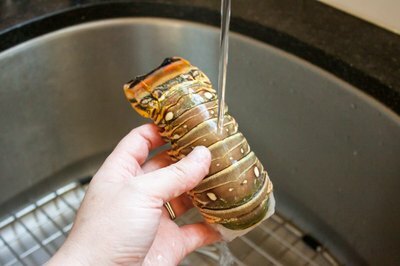 Defrost frozen lobster tails before cooking in the microwave. Do this either by thawing them in the refrigerator for 24 hours before cooking or by using the defrost setting in the microwave. Thawing in the fridge will ensure your meat stays raw and uncooked, but it can take a long time, even if you submerge the tails in water while in the fridge. Defrost your tails in the microwave -- place in a single layer -- on the defrost setting, checking every 30 seconds. Rotate the tails to ensure even melting. It will take roughly 1 to 2 minutes to defrost a single petite to medium-sized tail. Add on 30 seconds of defrost time per extra tail. Large and extra-large tails defrost on the defrost setting in 3 to 5 minutes, and require an extra 30 seconds per extra tail. Once defrosted, rinse your tails to remove any residue, and, if you wish, cut or butterfly your tails to expose the meat prior to cooking. Arrange your tails in a microwave-safe dish, with the tail fans towards the center. Cover your tails with microwave-safe plastic wrap, leaving one corner open to allow steam to escape during cooking. One medium sized lobster tail, with the shell on, will cook in roughly 2 1/2 minutes when microwaved on high. Add an extra 1 to 1 1/2 minutes per extra tail if you are cooking multiple tails. 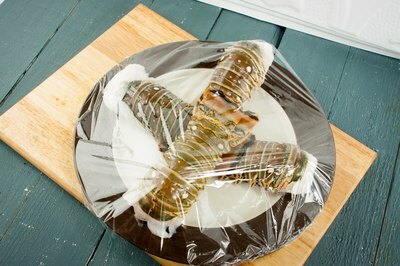 Rotate your lobster tails halfway through so that the tails are facing the edge of the dish. To ensure that your lobster cooks evenly and stays moist, add a 1/4 cup of water to the dish before cooking. You can also use a microwave steamer, which holds water in the bottom tray, while having a vented lid on top to capture steam to keep your lobster moist during cooking. Microwave the tails en papillote, seasoned and wrapped in parchment paper, to create a simple way of retaining all of the moisture of the tail during cooking. Wrap tails individually for an elegant presentation per person, or enclose multiple tails in one package if you are removing them from the paper prior to serving. Papillote cooking creates strong, condensed flavors as no liquid is added or lost during the cooking process. Cooking times are about the same, with each tail taking roughly 2 1/2 minutes to fully cook when microwaved on a high setting. 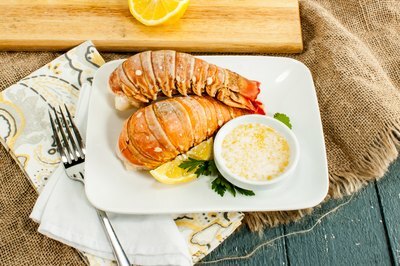 Lobster tails are done when the shell is a bright red and the meat is dense, opaque and white. Overcooked lobster will turn rubbery and have a chalky texture. Extreme overcooking can lead to dried out pieces of meat that are hard and difficult to chew. Because lobster continues cooking even when removed from heat, it is important to undercook slightly and give it some resting time before serving. Because all lobster is perfectly cooked when the meat measures 135 degrees Fahrenheit, stop cooking when the internal temperature reads 130 F. The only way to accurately measure internal temperature -- and thus perfectly cooked lobster -- is with an instant read thermometer. Let all lobster tails rest for 5 minutes prior to serving.